Thy Hand Hath Provided: Who's With Me? Thanksgiving has come and gone. Have we all been sufficiently stuffed and thankful? The way I see it, between now and Christmas I need to have a plan. Aside from all the excitement of Advent and the anticipation of the celebration of Christ's coming, there is another emotion that plagues me this time of year. Guilt. I'm not talking about gift-giving guilt or spending guilt. I feel as if I have those guilts well under control this year. The guilt I'm referring to is the guilt of over-indulging. I know that it's after New Year's Day that we're all supposed to turn over those new leaves, but this year, I'm not going to wait until I'm disgusted with myself. This year, I'm going to be proactive and keep that guilt from tainting all the excitement, anticipation and celebration I'm looking forward to. I'm wondering if you'd like to join me. 1) I'm going to hold off making any Christmas sweets (I mostly make cookies) until December 13th. My problem usually is that I get so caught up in the spirit of Christmas cookies (note this "spirit" is not capitalized), that I begin making them right after Thanksgiving. Then, I eat them. Then, I make more because we've run out. Then, I eat those, too. And by "I", I do mean mostly me. This cycle continues until we travel to be with family where I begin enjoying all their treats, feeling incredibly guilty because I have spent the entire month of December making and eating, making and eating, making and eating my own. 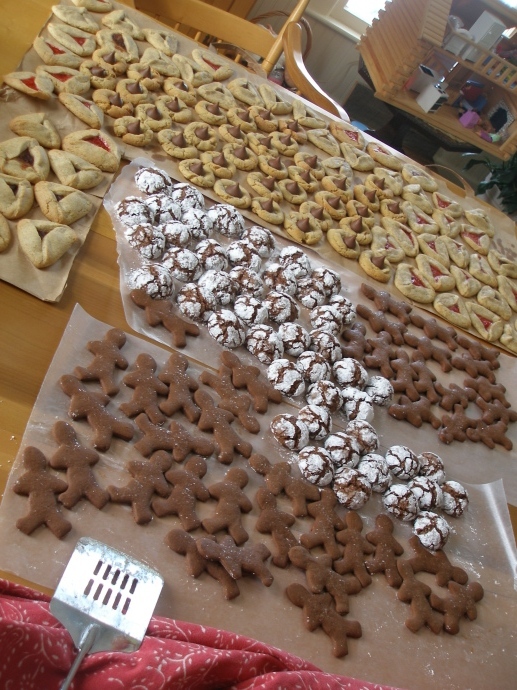 Some of last year's cookies. 2) I will not be eating anything after dinner. Water and tea are allowed. About three weeks before Thanksgiving, my sister and I made a pact with each other that we wouldn't eat after dinner until Thanksgiving and, man, it is tough. No eating after dinner is a habit I'd like to continue. Since we normally eat an early dinner, I'm hungry for (and usually consume) the equivalent of a fourth meal, oh, around 9 pm. Not such a good habit. I do better with short term goals, so I'm re-setting the goal and will not be eating in the evening until Christmas Eve. My goal is to be successful at this 90 % of the time- I'm bound to have an occasion to eat something at a special pre-holiday activity and don't want to feel guilty (Remember? That's the goal.) if I slip up. 3) I am going to try my hardest to be active at some point every weekday (except travel days) between now and then. I've been trying to do an exercise video (Netflix is great for this because you can get a new one once you're bored) with the kids every weekday mornings after breakfast. The kids love it and except for the fact that Miriam climbs up onto my back when I try to do push-ups (this makes them very hard) it's a good option. Other options for me are doing some Pilates, walking on the treadmill, walking the track with the girls while Sam's at PE and running up and down our stairs. Any activity is better than the no-activity I've been getting since we've been back to school this fall. Getting moving is not just good for my health -it also has a positive affect on my mood and helps me make better food choices because I don't want to negate my morning workout. 1) Nowhere did I say "no sweets". As much as my Lenten experience of cutting out sugar was an amazingly eye-opening experience (and I plan on doing it again this coming year), I am a product of my culture and from where I'm from, celebrating includes special (sweet) foods. 2) Nowhere did I say anything about "pounds" or "pants fitting". I have accepted that my body will never be the same (weight or shape) as it was before kids. This doesn't mean I shouldn't take care of it, it just means that I will not set unrealistic goals for myself that lead to...you guessed it...more guilt. This Thanksgiving to Christmas Plan is intended to help me find balance between enjoying the celebration and keeping my health (both physical and emotional) in check. So, bring on the celebration of the coming of our Risen Lord without the distraction of guilt. I'm with you on this one! I think you have a GREAT plan, so thank you for coming up with it! I do EXACTLY what you do when it comes to baking, (although my husband eats even more than I do!) Anyway, I'm all for enjoying a "guilt-free" holiday season! I like this! So glad to know I'm not the only one baking like crazy and eating it all! :) Plus I'll save some cash between now and Dec. 13 if I don't bake. Admittedly I dove into the candy bags last week...trying to save some $ and not go running for my weekly bar of dark chocolate. I'm heading out for the dark chocolate this week so I have something to nibble on. Thanks for sharing your sensible, doable yet still challenging plan! 1) No sweets to be consumed at home until December 23rd. 3) No more than two peppermint mocha lattes a week (I seriously think this will be the hardest!). I am going to join you in the no food after dinner. I started that in November too and then got off track. Exercise is not hard for me right now as I am working towards my 1000 mile goal and I am so close so it keeps me running a fair amount each week! Christmas treats - I am thinking this one over and I haven't quite decided what to do. I love to make them but I too eat more than my share! Oh, by the way my kids and I loved the Mission India programs each week. Thanks for blogging about it! Oh I'm the same with the Christmas baking - I get so excited by it all I do it early & then there's nothing left for Christmas! I like the idea of waiting until mid December - it will work well as that's when our school year ends! We don't usually have anything after dinner & you definitely feel better the next day! I'm with you. Each year, from Thanksgiving (actually it starts the week before with my birthday and a Mississippi mud cake) until the New Year I go through this same cycle of eating, making more and then eating that. I'm joining your pact to not eat after dinner and to find more opportunities to exercise more. Wow look at all those cookies. Hard to resist. That's a good plan. Last year I was in the process of losing a bunch of weight and was surprised by how much easier it was to avoid overindulging when I had that goal in mind. I thought I would feel totally deprived at this time of year, but it was fine overall. Good luck to you! Maybe I'll try to replicate it again this year . . . This is a great idea. I'm in! Oh great, you just made me feel guilty...I've already made two kinds of Christmas cookies, there's a third one in the mixer, and it's not even December! I will slow down from here on out, I promise. (I do freeze them, though, so it's not like I eat them all at once!) And, I'm not going to eat after supper. I like that idea! Thanks for this post!